The Anton Bauer Battery Mount for Litepanels allows you to connect a Gold Mount Anton Bauer broadcast battery (not included) to a Litepanels 1x1 Daylight LED head for portable use of an otherwise AC powered-only continuous lighting system. Note that this mount is designed specifically for the Litepanels 1x1 Daylight LED Kit. It will not work on the Litepanels Astra 1x1 Bi-Color LED Panel. You must (2) of these mounts to attach to each head that comes in the Litepanels 1x1 Kit. Note: This rental is not for a battery. It is for a battery mount. Batteries are rentable separately. 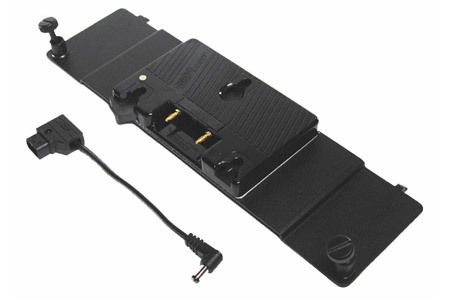 • This mount is compatible with Anton Bauer Gold Mount batteries, which are not included. • This mount is designed specifically for the Litepanels 1x1 Daylight LED Kit. It will not work on the Litepanels Astra 1x1 Bi-Color LED Panel.